This is common career advice–well, career aphorisms. It doesn’t have to be one or the other, but you do have to find balance. Of course, it’s ideal to be passionate about your work. Ideally, your work is a well-integrated part of your life and not something you just go do to get a pay check, then live your “real life” on the side. Work is and should be part of your identity. It should be something that your family knows about and in some ways participates in. But practically, you need to bring home a pay check. And at some point–for everyone–that means working a job you don’t like in order to put food on the table. That’s realistic! People who are passionate about the work they do–love their work–have followed their dreams. But they also deal with onerous tasks at work–every.single.day. All jobs have something about them that you don’t like to do–whether that’s paperwork, making phone calls, editing, being self-disciplined. There’s always some piece of your day-to-day work–even if you love your career–that you don’t like. You have to be realistic about what it means to successfully pursue your passions and do what you love. 1- People who’ve been unemployed, underemployed or made the choice to leave the workforce for a period of time who want to re-enter the workforce. When you decide to go back in, you have to be realistic. On the one hand, you have be confident about the skills and experiences and qualifications that you do have. You have to confidently be able to articulate how those things will serve the employers where you want to work. On the other hand, you’re entry level if you’re re-entering the workforce after a decade. You can’t say, “I want to be making the same money I’d be making if I’d never left the workforce and I want flexible hours that allow me to be a hands-on parent and I want to be working only in an area that I feel 100% passionate about.” That’s the same as throwing up your hands and saying, “Oh well. Guess I can’t go back to work!” Flexibility probably means lower pay. High pay probably means a lack of flexibility and a level of stress that can impact quality of life. Instead, be realistic about starting at the entry level while keeping your eye on your goals and dreams. From there, work toward your ideal. Climb to the top as fast as you can! But don’t imagine that you can jump in at the top. 2- Recent grads who’ve never been employed in career-type work suffer from this idea that they’ll jump in as management right after graduation. It’s a mistake to assume you’ll never have to do “secretarial” work. Imagine if you’d refused to type at some point because it was “below you.” Or thought that filing digital documents was someone else’s job. Your laptop would be useless, a mess or both. And so will your work life if you don’t embrace everyday tasks like filing, taking messages, making copies, organizing and scheduling meeting & events, writing agendas & sending memos, and generally troubleshooting day-to-day problems around the office. This is part of everyone’s work life now. If you want to be able to lead a meeting, then you have to be able to plan a meeting! Find the balance between shooting for the stars and knowing you have to start somewhere. You’ll always have to do some grunt work; there’s an unpleasant side to every job. 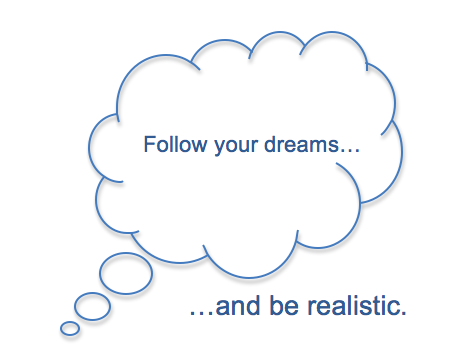 Follow your dreams…and be realistic to find balance in your career aspirations.